IBM notes mail client has the All Documents view which will display all the documents which are present in the email application. This NSF file conversion tool allows you to convert complete data. You can migrate emails, contacts, calendars, to do list and journals from single or multiple NSF files. Software keeps the Meta properties, attachments and formatting intact. There will be no loss of information experienced while exporting NSF to EML / MSG file. 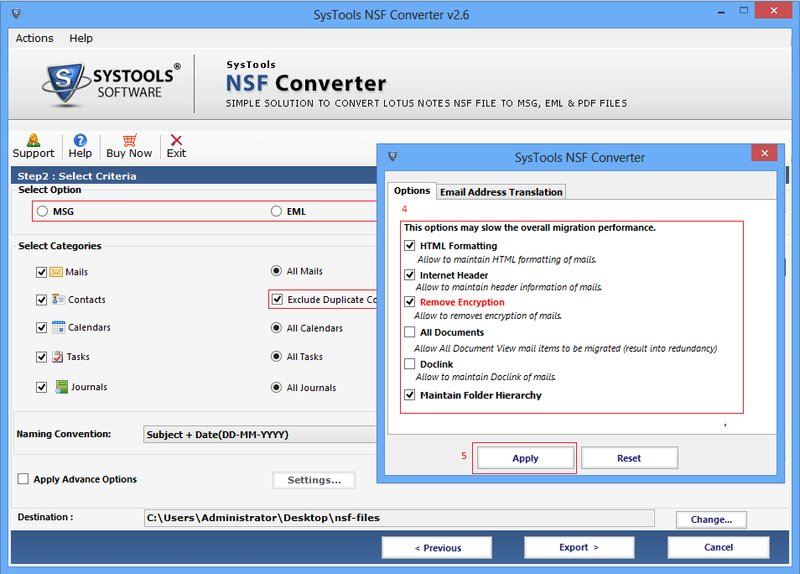 The NSF Converter offers three file conversion options. You can convert NSF to EML or convert NSF to MSG or format. In both these options, you can convert all the items present within Lotus Notes NSF file. After conversion in any of the two file types, you are free to use the files in different applications like; Outlook, Outlook Express, Windows Mail etc. 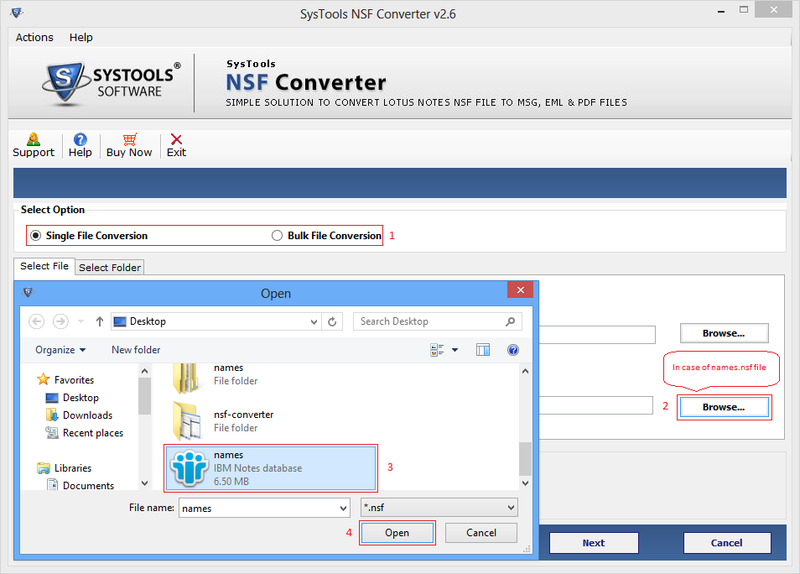 Through the NSF Converter tool you can convert multiple NSF files; saved in a common folder. There will be no limitation on the number of files that can be converted. Software allows you to directly select folder having NSF files. Also, you can search for NSF files within sub folders using the tool. The NSF file conversion program allows you to migrate all the items present within the NSF file such as emails, contacts, calendars, Journals etc. Now if you want, you can only convert selective items instead of exporting them all. Simply check or uncheck the files to convert the item of your choice. Lotus Notes NSF file converter maintains the folder structure of NSF file to save the data. Now, if you convert NSF files into EML or MSG formats, software ensures not to make any changes into the original structure. In order to keep the folder hierarchy maintained, you have to check the available option. During the conversion from NSF file format, NSF Converter utility provides an in-built option to implement Date Filter Option. This feature allows the users to selectively export the NSF file elements within a specific date range into EML & MSG file format. 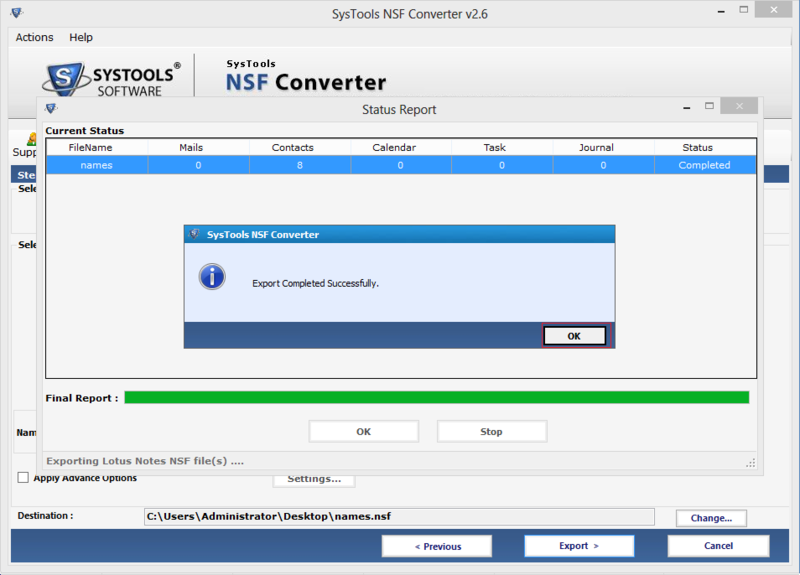 Step 4: Export NSF to MSG, EML etc. and above should be installed properly (Not Configured for Domino Server). Can you please share the important characteristics of this software? Can I convert multiple NSF files into EML format? Yes, NSF Converter is capable of performing bulk conversion. Multiple NSF files under a single folder can be converted at once. Does the software show any compatibility issue with Windows 10? No, you can run this software on all versions of Windows without experiencing any performance related issues. Is installation required for running this software? Yes, client 6.5 or above should be installed on conversion machine and it should also be configured with any POP3 or dummy profile. Please make sure Notes client is not be connected to the Domino Server while conversion is in process. And the NSF file being used should be accessible / healthy. Does software also convert password protected NSF files? If you don't know the password set on NSF file then you won't be able to do the conversion as software asks for password while converting respective file. What is the maximum size of NSF file that I can convert into EML? Software doesn't have a size limitation for NSF file. You can convert any size and any number of NSF files within few minutes. Does the software convert meetings and contacts from NSF to MSG format? Yes, software converts all data items (emails, contacts, calendars etc.) from NSF to MSG and EML formats with folder structure maintained. Can I process NSF files from Network Drive? Yes, the software can also process NSF files from Network Share. But we recommend our users to copy the NSF file at a local hard drive location as it will take more time to process a file directly from the Network. Should I have Outlook installed on my machine to convert NSF to MSG? No, software can perform NSF to MSG conversion even without Outlook installation. However, if you want to open those MSG files, then Outlook installation will be required. When the software provided option to convert data to two formats as EML or MSG we were really amazed that with this much small investment we are getting the most out of the solution. We witnessed perfect conversion of NSF database to EML and MSG without much time or effort demanded. It was an immensely fulfilling experience to work with NSF Converter as the tool converts mail and other data from NSF to MSG and EML file format. But the tool uses chosen target file format i.e. EML or MSG respectively; for saving NSF contacts, calendar entries, etc. ; too. I have had so much trouble migrating NSF to EML but this NSF File converter Tool has provided me with such handy features that helped me finish my task easily making it trouble free. Thanks to the SysTools team! 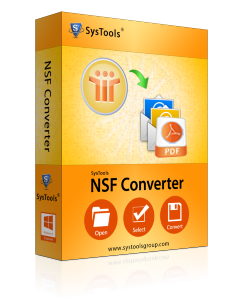 My experience with this NSF Conversion tool have been amazing with some really usable features like searching within subfolders enabling users to convert NSF to MSG File effortlessly. A must have tool that everyone should try.